Maj. Gen. William T. Cooley is the Commander, Air Force Research Laboratory, Wright-Patterson Air Force Base, Ohio. He is responsible for managing a $2.5 billion Air Force science and technology program and an additional $2.3 billion in externally funded research and development. 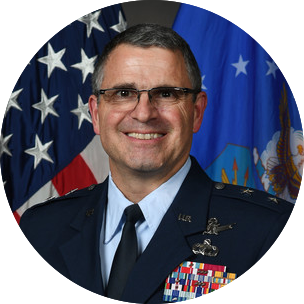 He is also responsible for leading a government workforce of approximately 6,000 people in the laboratory's nine component technology directorates and the 711th Human Performance Wing. General Cooley entered the Air Force in 1988 through the ROTC program after graduating from Rensselaer Polytechnic Institute with a degree in mechanical engineering. He entered active duty in January 1990 after completing a master’s degree from the University of New Mexico, and went on to earn a Doctorate of Philosophy in engineering physics from the Air Force Institute of Technology. General Cooley served in a variety of technical management, leadership and staff positions including commanding at the group and wing level. His assignments include Director, GPS Directorate, Space and Missile Systems Center, Air Force Space Command; Commander, Phillips Research Site and Materiel Wing Director, Space Vehicles Directorate, Air Force Research Laboratory; System Program Director for operational command and control programs; Program Manager, Air Force Distributed Common Ground System; Defense Sector Program Manager, Office of Security Cooperation-Afghanistan, Kabul; Program Element Monitor for Military Satellite Communications, and staff officer at the Warrior Preparation Center, Einsiedlerhof Air Station, Germany. Prior to assuming command, he was the Program Executive for Programs and Integration, Missile Defense Agency, Redstone Arsenal, Alabama.